For your convenience, we've placed only a few images on each page of this gallery. When you are ready, go back to pages 1, 2 in this Gallery, or use the tags at the top to view other galleries on our site and place your order. On the Ready©. 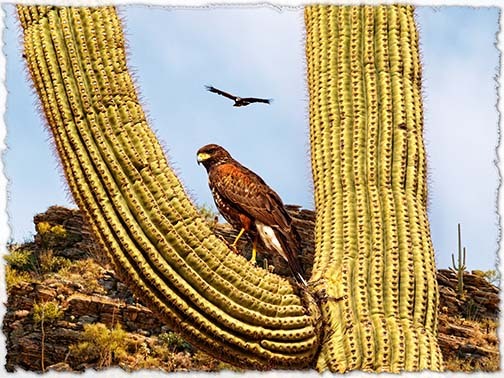 A handsome Harris hawk stands in the crook of a saguaro while keeping a sharp eye on the ground. Perhaps a nice bunny or a mouse would like to join him for lunch. In the background, it appears that a relative is flying in for the feast. Silent Visitor©. The day is dark and overcast with a bit of fog. Somewhere in the desert there is a tableau of cactus, lichen, and rock that brightens even under the subdued light of the day. And unexpectedly, a little ocelot scampers soundlessly up the rocks in search of an appetizing and sleepy bunny. Stepping Out©. 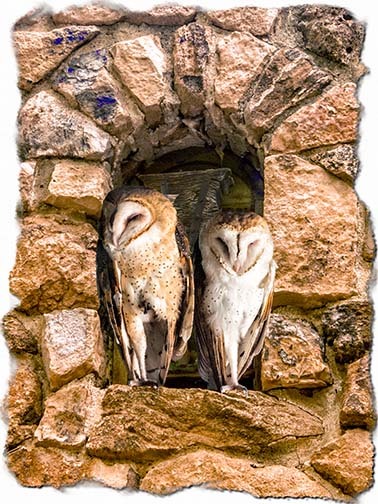 Two barn owls have found a perch in a window of this old building. Each is standing on a single leg; their eyes seem almost closed. Are they asleep?—or just waiting stealthily for a little lunch to pass by outside? You will need to keep watching. 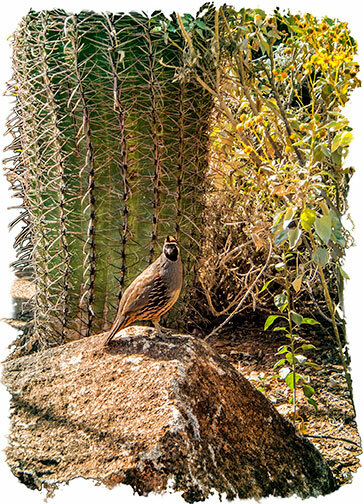 Top of the Rock© is a Gambel’s quail standing there quietly. In fact, he is a scout watching carefully to be sure that no harm comes to his nearby mate and their huge brood of tiny chicks. Don’t move a muscle, but stand yourself and listen. Soon he calls out—not just to his mate, but to his buddies in the area: “All clear.” Everything is safe, at least as viewed from the top of the rock. 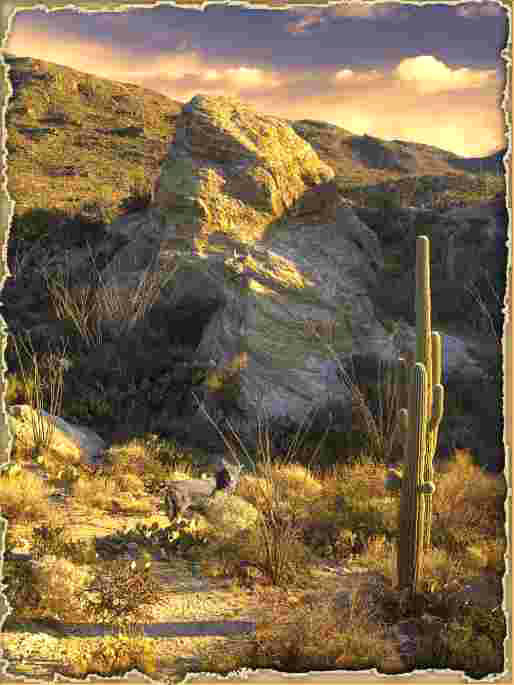 Toward Twilight© a coyote wanders stealthily down the Rincon Mountains in search of a morsel or two. 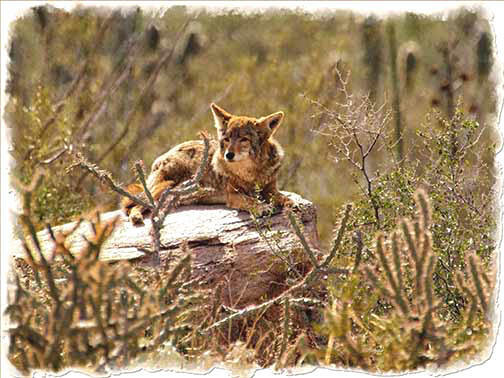 He stands now, before a little rock outcrop in Arizona’s Saguaro National Park East. The sun is beginning to drop, and the air is becoming cooler. He waits. Up a Tree©. 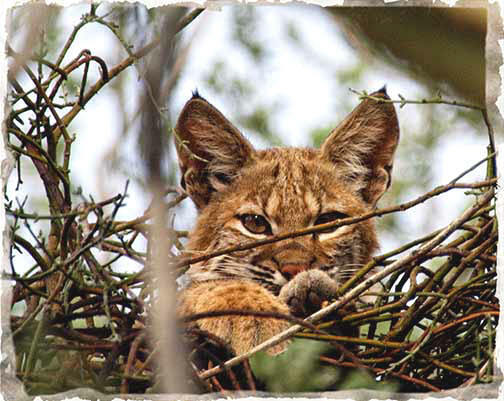 A young bobcat has been prowling the area looking for an unwary rabbit or bird that would like to join her for lunch. Between making her rounds, she conserves energy by returning to her lookout post twenty feet up a mistletoe encrusted ironwood tree. There, she can watch us, but we can’t see her. Or can we? The Way It Was© presents Tucson’s San Xavier del Bac mission, now an exquisitely preserved old Spanish mission in the Baroque style. This was among the missions founded by Father Kino through both southern Arizona and northern Sonora. The antique photograph used as a basis for this image was taken in black and white by Henry Buehman in 1877 long before Arizona statehood. What Are You Looking At?©. A little unpaved dirt road in the Santa Rita Mountains seems abandoned. At least that was why a few white tail deer decided it was a nice place to wander. So it turns out that this guy is surprised to see you here—and curious as to what you are doing. How will you answer? Wile E. Coyote©. Appearances can be deceiving. He looks like a friendly creature just taking in a little sun while dozing on a rock. But the rocky perch gives him a better view of what may be moving somewhere under the brush. When it moves, he jumps, and settles in for lunch. But no, he doesn’t need his belly rubbed or his ears scratched.